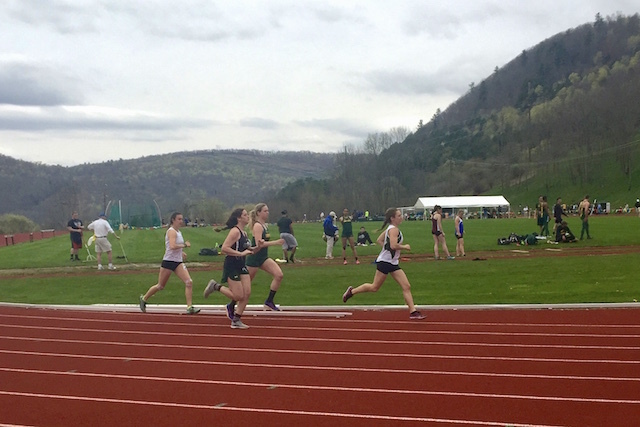 Hampshire College recently competed in its first track season. Yes, Hampshire College now has a track program. The Track & Trail Running team began this year as a joint effort by student cross-country runners, Hampshire staff from OPRA (Outdoor Programs, Recreation, and Athletics), and other student athletes passionate about track. 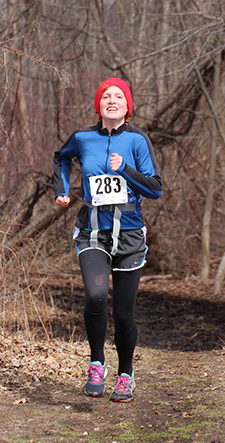 Student Sophia Mueller finishing the Merrimack River Run 10 Mile Trail Race on April 8. Track and Trail brings in students who hadn’t been part of the athletic program, and also enables winter and spring athletes to remain active and in training. On the roster this spring were 25 students, led by head coach Eric Nazar and assistant coach Elena Betke-Brunswick. “Almost all of the cross-country team has been out and running, and a handful of other folks, some who did track in high school and some who are brand new to the sport and just learning,” says Nazar. “For me, this is an impressive first year, and we really want to be thoughtful about how we build the team.” Nazar says he believes Hampshire has the potential to do well in the "oddball" events — the ones other schools may view as alternative, such as the 5k and the 10k, the 3k steeple, and hurdles: “I think those are an opportunity for us as a track team,” he says. Most schools have track and field, so why “Track & Trail”? The answer lies with the cross-country runners on the team who wanted to do more than just go around a track: running distance is better done through the woods and up mountains. For most people, a 10k on trails is a lot more fun than is simply doing 24 laps. Thus, the schedule for the season has been a combination of track meets, culminating in the USCAA Nationals in Delhi, N.Y., and trail races. And that’s true. Five months ago a track-and-trail team was just an idea; already Hampshire students are scoring points at meets. 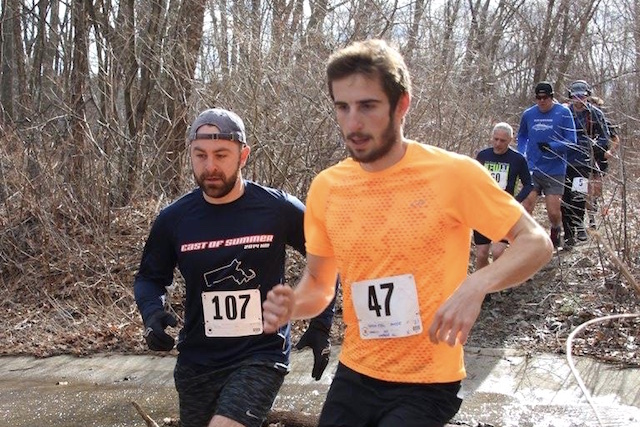 The last event of the trail runners’ season, which took place May 6, was the grueling Seven Sisters Trail Race, right in Hampshire’s backyard. The team's final schedule and results are available here.